Significant nuclear, rail and diplomatic deals have been “pushed forward,” yet China remains a concern. A slew of statements and potential deals have come out of the bilateral summit between Japanese Prime Minister Shinzo Abe and his counterpart Narendra Modi. While both leaders are keen to play up both their personal relationship and the size of the cooperation between the two countries, final agreement on key deals expected from the summit were lacking. While this does not mean the bilateral meeting was a failure, it does indicate that the two sides have a longer way to go before deepening their ties into a more strategic relationship. This is especially noteworthy given how at least indirectly influential China was in some of the most important aspects of their meeting. Most of the progress that was made during Monday’s meeting was on the economic front, as Japanese investors are anxious to enter India’s vast and still largely underdeveloped market, and India seeks to benefit from Japanese corporate and government investment in badly needed infrastructure. Abe said Japan plans to spend 3.5 trillion yen ($33.9 billion) in yen denominated loans and investments in India over the next five years, according to the Jiji Press. The funds will be a mixture of private sector investment and official development assistance to be spent on infrastructure (including rail, roads and industrial parks), rural development projects and food processing. India’s decision last month to raise the insurance and defense industry cap on foreign investment from 26 percent to 49 percent, and plans to allow for complete foreign ownership of rail enterprises, are very large incentives for Japanese investment. Additionally, the Japanese Business Federation (Keidanren) is planning on sending a mission to India as early as mid-2015, ahead of a potential visit by Abe. Likewise, while India’s new increase in its defense industry’s investment cap will be highly enticing to Japan now that it has passed legislation allowing military exports, no final deal was reached on the export of the Japanese US-2 amphibious aircraft, although both sides said they would continue to work toward that goal. The two leaders did agree to hold “regular joint naval exercises with the U.S.,” as well as committing to upgrading defense ties. However, one of Japan’s most anticipated deals with India, the so-called “two-plus-two” ministerial framework failed to materialize, which is an upgraded diplomatic framework in which the countries’ defense and foreign secretaries meet regularly to discuss cooperation. Such a framework is important for Japan, and it has one with its largest allies like the U.S., France and Australia. The summit was indeed high on rhetoric. 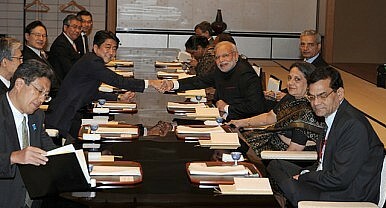 Abe referred to their meeting as a “strategic relationship,” while Modi said that during their talks the two had decided to “step up the strategic relationship to a ‘special’ strategic relationship.” Both leaders understand the large economic benefits of a closer relationship, while mindful of the security component such a heightened relationship would entail, particularly vis-à-vis China. However, the relationship with China cuts two ways, particularly with India. There is speculation that Modi held back on following through with the “two-plus-two” framework because of Chinese President Xi Jinping’s upcoming visit to India, and the possible impact on any Chinese investment plans being considered. Indeed, while India has its own security issues with China, particularly along its northern border, those problems are nowhere as intense as those China and Japan are experiencing. Additionally, India is in much greater need of Chinese development, beyond the amount that Japan is able to offer. As Xi is visiting India shortly after Abe in mid-September, Indian officials speculate that the government and other concerned parties will wait until both sides have made investment proposals before choosing which to accept. India may choose in the end to favor Japan in areas like high-speed rail, nuclear technology, and defense deals, but that favoritism will likely be tempered by India’s need to work with its much more powerful northern neighbor, particularly when it comes to investment. Abe’s government is anticipating regional events by visiting with key partners over the next month.